I’ve just been reading a brand-new edition of Dee Brown’s Bury My Heart at Wounded Knee, out just last month from Sterling Publishing. It’s a beautifully packaged and illustrated version of the landmark 1970 work, which looks at the West from 1860-90. I recommend it highly. 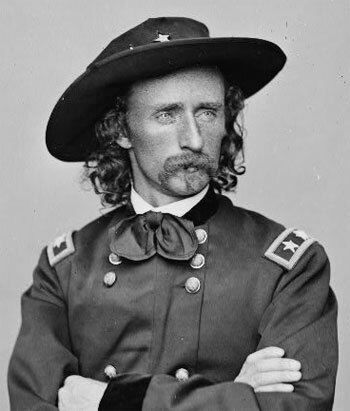 You probably recognize the dashing man above as George Armstrong Custer. A young West Point graduate (1861) and aide to General McClellan at Antietam in 1862, his star rose quickly in the US Cavalry Service during the War. In 1866 he was appointed Lieutenant Colonel of the new 7th United States Cavalry and spent the last decade of his career leading them in action against Indians. 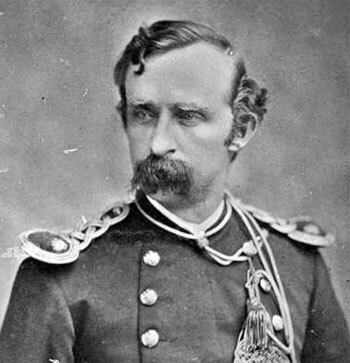 His Colonel from 1869-76, by the way, was fellow Antietam veteran Samuel D. Sturgis – who was for that period on detached service, leaving Custer in charge. Custer met his end in 1876 at the Battle of Little Bighorn, also known to history, of course, as Custer’s Last Stand. Jacob D. Cox is remembered as something of a third wheel at Antietam. There he was the Ninth Army Corps commander under the direct supervision of “Army Wing” commander Ambrose Burnside. Cox had been a lawyer and politician in Ohio after a theological education at Oberlin College, and was a major player in the forming of the new Republican Party in Ohio in 1855. By 1860 he was in the Ohio State Senate, and his friend Governor Salmon P Chase appointed him Brigadier General of Ohio troops in 1861. 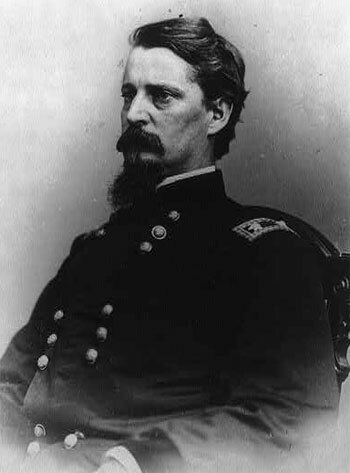 After Antietam, General Cox had an administrative command in Ohio, and led a Division in the XII Corps at Atlanta, Franklin and Nashville. He was elected Governor of Ohio while still in uniform, and served one term. 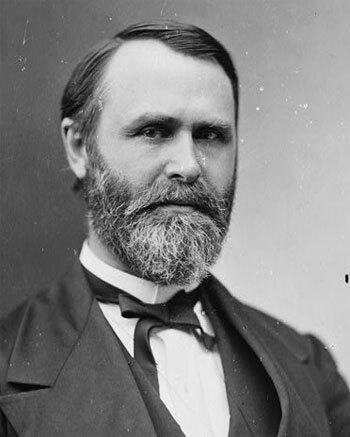 In 1869, with the United States engaged in significant combat with Native Americans across the West, Cox was named by President Grant to be the new Secretary of the Interior. Interior was home to what’s now called the Bureau of Indian Affairs. The head of the Bureau – the Commissioner of Indian Affairs – at that time was Ely Samuel Parker, a Seneca with Federal military experience. Cox didn’t last long, however, resigning from Grant’s cabinet in 1870 in disagreement with some of the business practices he saw at Interior. 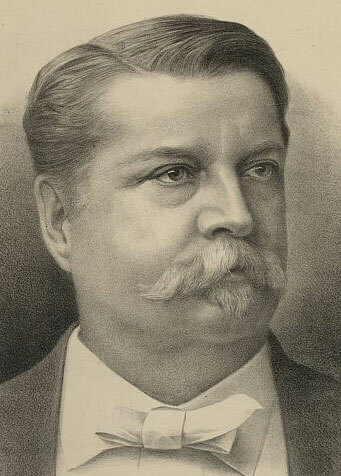 Jacob Cox later practiced law, managed a railroad, was elected to Congress, served for many years as Dean of the Cincinnati Law School and presided at the University of Cincinnati. Winfield Scott Hancock may have been predestined by his name for a life-long career in the Army, and he had just that, entering West Point from Pennsylvania in 1840. He had a nearly unbroken run of success thereafter leading very nearly to the White House forty years later. He graduated from the US Military Academy in 1844 and was first in combat in Mexico, serving there in 1847 and 1848 with the 6th US Infantry. He was appointed Captain in the staff corps in 1855, serving as a Quartermaster in Florida and “Bleeding” Kansas. As the War began in 1861 he was stationed at Los Angeles, California, from whence he returned to Washington and a commission as Brigadier General of Volunteers in September 1861. He was a star of the Army of the Potomac from his arrival to the end of the War. At Antietam, General McClellan pulled him from his Sixth Corps Brigade to take over General Israel Richardson’s Division in the Second Corps when that officer was wounded in the Bloody Lane. 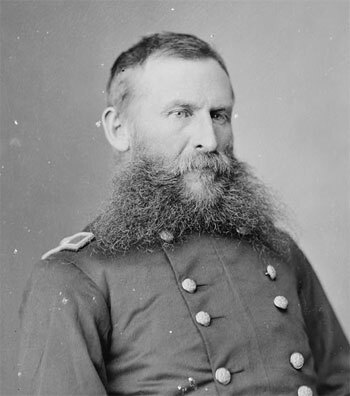 Hancock was soon after Major General and commanded that same Army Corps at Gettysburg, where he was seriously wounded – action for which he later received the “thanks of Congress”. He returned just after Christmas 1863 and led the Corps through all of its battles to War’s end – the longest serving Corps commander in the Army. He was promoted to Major in the Regular Army in 1863 and jumped to Brigadier General in 1864. After duty at Washington overseeing the execution of the Lincoln assassination conspirators he resigned his Volunteer commission and was made Major General, USA in 1866. He had a brief foray West – where he made things worse with the Sioux and Cheyenne – and then a Reconstruction post commanding the Military District covering Louisiana and Texas. He had a more substantial sojourn in the Dakotas (1868-72), directing difficult relations with the Blackfeet and Sioux, but largely avoiding all-out warfare. He made his final Army move to the headquarters of the Division of the Atlantic at New York City in 1872. Although never elected to office, Hancock was a respected public figure, and had received nominating votes at Democratic National Conventions of 1872 and 1876. The time was seen as right for him in 1880, though, and he became the Democratic candidate for President. After an extremely tight election – the difference in the popular vote was only about 10,000 – he was defeated by Republican James Garfield. Hancock returned to the duties of his command, and died at Governor’s Island, NY, still in the uniform of his country, in 1886. 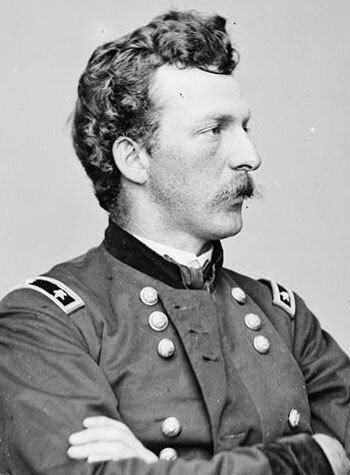 George Crook, by contrast with fellow Ohioan Jacob Cox, was a career Army officer from the West Point Class of 1852 who had seen significant combat against Northwestern tribes in the decade before the Civil War. After coming East in 1861, he served in Cox’s Kanawha Division in Western Virginia, at 2nd Manassas, and at Antietam as commanding officer of the 36th Ohio Infantry. Later in the War he led cavalry units up to the Division level. Post-War he gained a reputation as “the best Indian fighter” in the Army with service back in the Pacific Northwest, on the Great Plains and in the Arizona Territory. In 1876 he was a Brigadier General and commanded the Bighorn and Yellowstone Expedition during which Custer’s command was annihilated. He was a Major General, USA, commanding the Division of the Missouri at his death in 1890. Crook is remembered most for his success against Apaches in Arizona, initially under Cochise (c. 1870) and then Geronimo (1882). Oliver Otis Howard had an auspicious start as a young man, graduating from Bowdoin College at age 19 and subsequently 4th in the Class of 1854 at West Point. He first saw action in the Seminole War of 1857 in Florida, and was a mathematics instructor at the USMA when the War began in 1861. He was a Brigadier General of Volunteers on the Peninsula Campaign, and on 1 June 1862 at Fair Oaks, Virginia, “[l]ed the 61st New York Infantry in a charge in which he was twice severely wounded in the right arm, necessitating amputation” – according to his Medal of Honor citation. He was back on duty by Antietam, though, where he led a Brigade in the Second Corps and relieved General Sedgewick in command of his Division when that officer was wounded in action in the West Woods. He had mixed success after he was appointed to command the XI Corps in November 1862. He was generally labeled a failure after Chancellorsville and Gettysburg in 1863, but he did much better in the Western Theater later, becoming in 1864 the commander of the Army of the Tennessee. For most of the decade after Appomattox, General Howard was commissioner of the Bureau of Refugees, Freedmen, and Abandoned Lands – better known as the Freedmen’s Bureau – and was instrumental in the founding of Howard University in Washington, DC. He was posted west to Washington Territory in 1874 and – not wanting to be known as an Indian lover – campaigned ruthlessly against the Nez Perces, leading to the surrender of Chief Joseph in 1877. He was briefly Superintendent of the US Military Academy (1881-2) and retired as a Major General in 1894. The man who later vied with both Crook and Howard over the credit for defeating Chiefs Joseph and Geronimo, and outlasted them all, was something of a rags-to-riches story. Nelson Appleton Miles began his military career as a volunteer at the start of the War, leaving night school and his job as a store clerk in Boston to enlist in the 22nd Massachusetts Infantry. He was appointed 1st Lieutenant of the 22nd in September 1861, and Lieutenant Colonel, 61st New York in May 1862. He took command of a combined regiment – his own and the 64th New York – when Colonel Barlow was wounded in action near the Sunken Road at Antietam, and was promoted to Colonel himself soon after. He acquitted himself very well in action through the War, being wounded at least 4 times, and was awarded the Medal of Honor for ‘distinguished gallantry’ at Chancellorsville in May 1864. He rose to the rank of Major General of Volunteers in October 1865. In 1866 he was commissioned Colonel in the Regular Army, and commenced a stint of more than 20 years fighting Indians in the West. 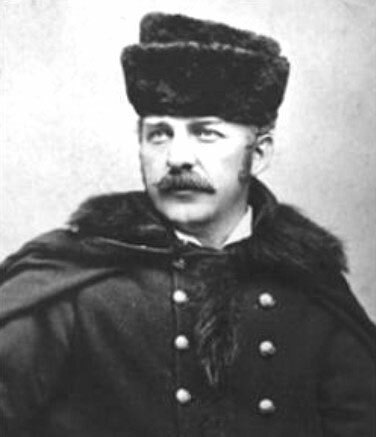 Here he is in 1876, apparently dressed for a Montana Territory winter. Is that bear fur? 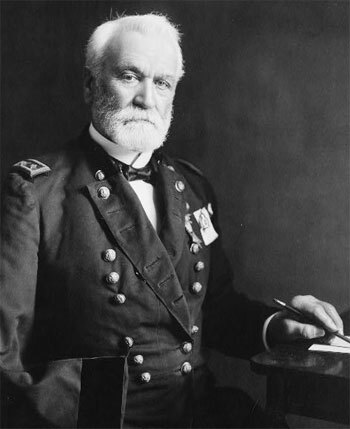 He was promoted to Brigadier General in 1880, Major General in 1890, and Commanding General of the US Army in 1895. He was in command through the Spanish American War, led the invasion of Puerto Rico, and was military ruler there. He was made Lieutenant General, USA, in 1900 and retired in 1903 – though he attempted to volunteer for service in World War I – and was the last surviving full rank General Officer of the Civil War at his death in 1925. Brown, Dee. Bury My Heart at Wounded Knee (Illustrated Edition). New York: Sterling Innovation, September 2009. Thanks for stopping in Jim – I hope I’ll catch you on the battlefield soon!